The inkers match Buscema's style much better in this 8th installment of the Marvel run of Conan, kindly reprinted by Dark Horse for those of us who came too late to read the original strips. Thomas continues his narration of the life story of the Barbarian, who's fast learning his way about the world. We start off with some more mercenary work, as Conan once more gets stuck into a mess created by his "ancestor," King Kull. An evil black spirit--used later by Tom DeFalco as an FF villain, even if he may not have directly said so--takes over the land, and only an equally terrifying spirit can stop it. But when all the civilized people lose their heads, can the one they look down on save the day with his brain when he's known only for his brawn? 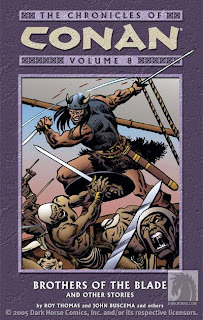 We also see Conan gain--and lose--more travelling companions as he moves towards one of the best Howard Conan stories, "Queen of the Black Coast." I was rather surprised to learn that Thomas left Conan in this part of his history for issue upon issue, since all the other direct adaptations last only for a few issues. I am looking forward to how this all plays out. After a relatively weak set of issues in the last trade, this is a refreshing return to better artwork and better storytelling. Even the oddball artwork by Ploog--think Conan set in a Tales from the Crypt style story, complete with an old witch!--in the set up issue for the "Queen" art works very well with the story material. Buscema is, of course, amazing as always, and his Conan really sets apart from the other characters thanks to inkers picking up on the purposeful styling of Conan as an almost Hulk-like character amongst the rest of the Hyperborian age. I can't see myself not recommending any of these trades for those who love classic comics, Buscema art, or the old pulps. However, I would rate this as one of the best, as Thomas, Buscema, and company really snych up here better than in the past few volumes. This is not a bad jumping on point if you don't want to read the prior seven. (And why not???) Definitely a strong recommendation from me.